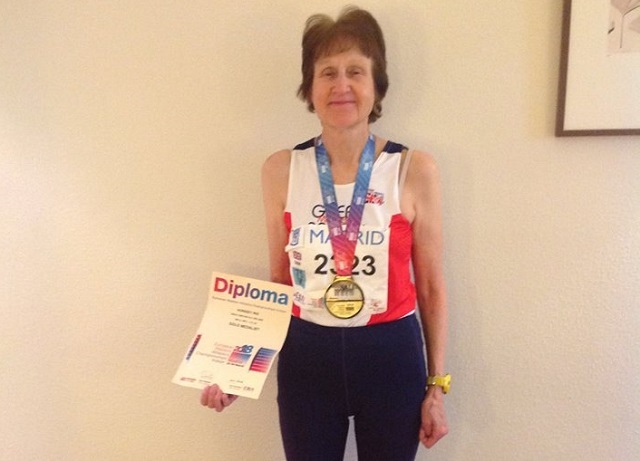 Spartan IRIS HORNSEY was a multi-GOLD medallist at the European Masters Indoor Athletics Championships in Madrid. On Tuesday she won GOLD in the women’s 75 plus 400 metres with 1 minute 41.35 seconds; on Thursday GOLD in the women’s 75 plus 800 metres in 3:52.46 seconds; on Friday GOLD in the women’s 75 plus 1500 metres in 7:51.4; and on Saturday she was second leg in the GOLD medal winning Great Britain and Northern Ireland 4 x 200 metres women 75 plus relay team. At the same championships RICHARD BRUCE was fourth in the 800 metres final for men 45 plus. He had qualified with 2:05.46 in his semi-final. CHRIS WESTCOTT just missed out finishing fourth in his semi final in 2:07.10. YUKO GORDON took GOLD for women 65 plus in the Hertfordshire county veterans cross country championship on Therfield Heath, at Royston in 25 minutes 47 seconds. She helped the Spartans to team SILVER for all over 55 with SHARON CROWLEY 33:18 and CATHY CRAIG who was second FV65 in 34:08. The women ran about five kilometres. For the men, Tim Saban and Andy Jay represented FVS, over approximately 9km. Tim was first Spartan home in 42.44, 37th place overall and 16th place in the V50 category. Andy finished in 51.36, in 54th place overall, and 29th place in the V50 category. After the weather disappointments of the last few weeks there were another ten Spartan twenties on Sunday as a team competed in the inaugural Bedford 20. It was billed as an incredibly scenic, superfast and traffic free two-lap course through stunning Bedfordshire countryside, and two of the three were true. But the 40% of the route on grass and gravel turned out to be very boggy, and often muddy in places, resulting in the route sapping the energy from the legs. Nevertheless, the Spartans still performed well with STUART HAYCROFT fastest Spartan home in 40th position in a time of 2:23:29 with KAREN ELLIS wasn’t complaining as she was the first female Spartan home with a new personal best of 3:13:01. The following table represents all the results of the Spartans out at this event. KAREN BROOM wanted a sub 4 hour so she was happy with her new PB of 3:46:39. It was JO BOWDERY’s first 20 mile race and the furthest she has run so far in her preparations for the London Marathon. She finished in 3:14:36. ADRIAN BUSOLINE was a top 100 finisher with 2:27:37. PETE SMITH came in with 2:43:03 and WENDY THARANI with 3:27:41. GERRY ROSEN finished in 3 hours 56 minutes 31 seconds; LIZ CARVELL in 3:59:00 exactly and ELLA GOWER in 4:15:16. Nine Spartans ran the inaugural London Landmarks Half Marathon on Sunday. They say it was really well organised with bands and lots of support along the way. It was flat if a bit twisty and turny. DUNCAN FLOUNDERS came in with 1 hour 34 minutes 19 seconds; NICK GILL in 1:38:39; ERICA GRAYSON in 1:57:48 and KAREN PALMER in 1:57:49. DAVID SCOTT improved his PB (personal best) by five minutes with 2:00:08. VICKY COTTOM finished in 2:10:42 and IAN ALEXANDER in 3:39:51. Erica said “Oon Sunday I replaced her Spartan stripes with a Tommy’s charity shirt and ran the inaugural London Landmarks Half Marathon. What an amazing day. Very well organised and supported. Then to top it all off Dr Ian Fergusson the co-founder and the original chairman of Tommy’s stopped me and thanked me for my support raising money for Tommy’s.” Tommy’s funds research into stillbirth, premature birth and miscarriage. At the Lee Valley Half DANNY SCANLON finished his first ever half marathon in 1 hour 33 minutes and 41 seconds. ANGIE KEELING improved her PB by just under 10 minutes with 2:14:42. In the Lee Valley 10K ROWENA RUTLEDGE finished in 59 minutes 1 second and KELLY CHAPMAN in 1:21:50. It was a lovely day in Hyde Park on Friday and having enjoyed a great training session with Fairlands Valley Spartans on Thursday evening JIM BROWN went round the Serpentine 5K in 25 minutes 26 seconds. MADDIE PRITCHARD did rather better with 23:27. Cool, dry and breezy. A couple of days later MEGAN TAYLOR and CHRISTOPHER JOHANNSEN ran the Hyde Park 10K in 1:01:35 and 1:28:21 respectively. NATALIE LAWRENCE was second female senior in the Eton Dorney 16 mile race in a time of 1 hour 56 minutes 27 seconds. She was 10th out of the 108 finishers. DAVID BOWKER went to Sandy on Saturday for Biggleswade AC’s open meeting. He ran the 3,000 metres in 11 minutes 38 seconds. The weekend parkrun’s action saw Spartans taking part across 5 different locations. Craig Halsey came in second place on his second visit to Hove on the South coast in a new course PB of 16:28. Meanwhile at Stevenage 14 Spartans ran. Danny Scanlan was 6th in a new PB of 19:22. Claire EMMERSON was first lady in a new PB of 22:53. Other Spartans running at Stevenage were Mark BEASLEY 23:04, Jonathan JONES 24:41 in a new PB of 24:41, Jo BOWDERY 25:31, Verity FISHER 25:57, Steven DOBNER in new PB of 27:38, Paul HOLGATE 27:46, Monica SMITHSON 28:07, James SOUTH 29:29 , Callum BEASLEY 30:42, Sally PHILLIPS 32.16, Peter CARPENTER 32.17 and Nicola PLUMB 36:21. Darryl STEVENS completed his 34th run at Brockenhurst in the New Forest in 41:37. Back in Herts at Ellenbrook Fields, John ROXBOROUGH ran a new course PB of 21:20. Tim SABAN made his second visit to Finsbury Park and ran a time of 21:15. Some other Spartans rode the Stevenage Start of Summertime cycle rides from Fairlands Valley Park.